The “Rome of the North” has 38 churches, most of them are Roman Catholic. The city also has at least 38 pretzel stands, most of them selling massive pretzels which look great but which taste kind of funny, like they’ve been sitting out in the damp air for a few days. 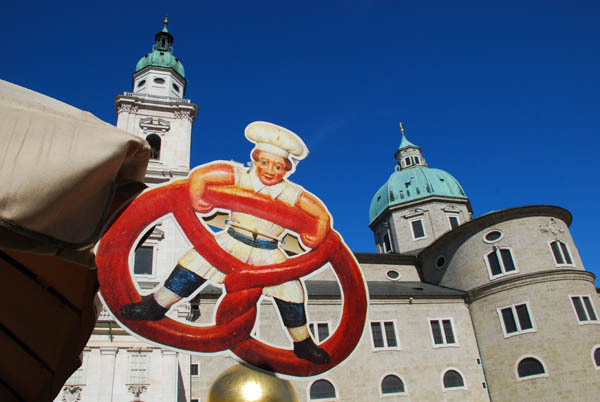 Today when we visited a small souvenir shop on the Getriedegasse the owner, who was even jollier than most Austrians, offered us all a freshly-baked pretzel. The smell was so intoxicating, how could one resist? He admitted that he makes them in his oven in the back of the shop, cranking them out every half hour. This is how he stays a little bit ahead of the competition. And, that competition is fierce. Getriedegasse has many souvenir shops, all selling about the same articles at about the same price. Rent is sky high at about $10,000 per month for a shop the size of some master bedroom closets. I used to be sort of neutral on Salzburg’s sights. However, I’ve come to really love the city for its architecture, the buzz of the center city, the many small cafes and restaurants and yes, even the pretzels. Now I know where I can get a free one, as long as I don’t mind coughing up $28 for a t-shirt. Posted in Austria Tours, New Discoveries and tagged austria, getriedegasse, salzburg.